On the afternoon of Friday 6th July 2012, the Olympic Torch will be carried through Hadleigh. The Olympic Flame or Torch is a symbol of the Olympic Games, originating at the ancient Olympic Games held at Olympia, Greece, from the 8th century BC to the 4th century AD. A sacred flame burned continually on the altar of the goddess Hera. At the same time, heralds were summoned to travel throughout Greece to announce the Games. The modern Olympic Games were revived at the end of the 19th century by Baron Pierre de Coubertin. The first modern Olympic Games was held at Athens in 1896. 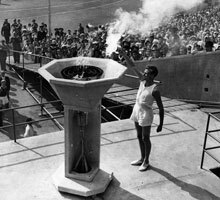 The Olympic Flame was reintroduced at the 1928 Olympics at Amsterdam. According to legend, the Olympic Flame has been kept burning ever since the first Olympics. The modern tradition of moving the Olympic Flame using a torch relay from Greece to the Olympic venue began at the Berlin Olympic Games in 1936. The triangular-shaped gold-coloured torch, designed by Londoners Edward Barber and Jay Osgerby, has 8,000 perforated circles and is 800mm tall. the vision for the London 2012 Olympic Games is to combine sport, education and culture. The aluminium torch is perforated by 8,000 circles representing the 8,000 Torchbearers who will carry the Olympic Flame. The gold colour symbolises the qualities of the Olympic Flame – the brightness and the warmth of the light that it shines. 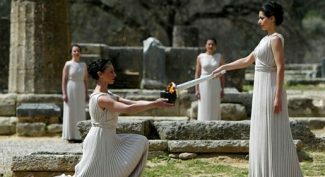 The Olympic Flame is lit from the sun’s rays at the Temple of Hera in Olympia, in a traditional ceremony among the ruins of the ancient Olympic Games. After a short relay around Greece, the Flame will be handed over to London at a ceremony at Athens. The Olympic Torch Relay will start at Land’s End on Saturday 19th May 2012. The Flame will then visit more than 1,000 cities, towns and villages in the UK– as well as Dublin in Ireland– before it starts its London leg on Saturday 21st July. It will then arrive in the Olympic Stadium on Friday 27th July as part of the Olympic Games Opening Ceremony. 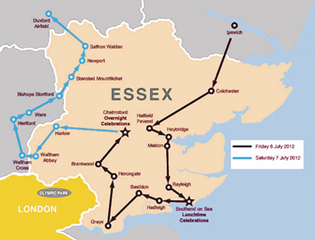 On Friday 6th July the Olympic Torch will travel between Ipswich and Chelmsford, via Colchester, Hatfield Peverel, Heybridge, Maldon, Rayleigh, Southend-on-Sea, Hadleigh, Basildon, Grays, Herongate and Brentwood. Fourteen Torchbearers will carry the Olympic Torch through Hadleigh, wearing white and gold uniforms. Six of the Torchbearers are from Essex – Bharat Thakrar from Harlow, John Hoskyn from Chelmsford, Jonathan Pearce from Maldon, Kim Axford from Canvey Island, Maddie Baker from Chelmsford and Sacha Sewell from Chelmsford. There are three Chinese Torchbearers – Qingnan Liu from Hebei Province, and Hong You and Shaowen Huang from Beijing. The other five Torchbearers – Alex Richardson, Erwan Puel, Fiona Palmer, Lindsay Fox and Oscar Ledesma Gaitan – are from other UK towns and cities. The oldest Torchbearer is John Hoskyn, aged 59 years. The two youngest Torchbearers are Maddie Baker, aged 12, and Qingnan Lui, aged 13. 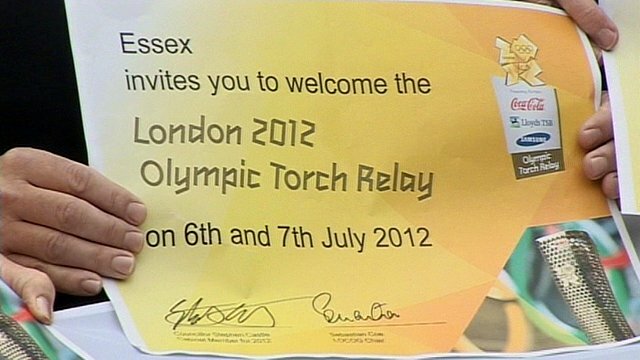 The Olympic Torch will arrive at Hadleigh at 1.49 p.m. from Leigh-on-Sea. It will be carried along the London Road and the High Street, and will then turn down Chapel Lane towards the Olympic Mountain Biking Course at Hadleigh Farm. At 2.30 p.m. it will be transported by bicycle around the Hadleigh Farm Mountain Bike Course. Returning along Chapel Lane, the Olympic Torch will be carried to Victoria House Roundabout where it will turn down Rayleigh Road. It will then be transported by convoy from Hadleigh to Basildon. The Mountain Bike events at London 2012 take place at Hadleigh Farm over the weekend of 11th-12th August, the final two days of the Olympic Games. Mountain biking is one of the newest Olympic sports and requires both technical skill and physical endurance. The first Olympic mountain bike races took place at the Atlanta Games in 1996. The event is held as a single race around the course, with all the mountain bike riders starting together. The winner is the first to cross the finish line and gold, silver and bronze medals are awarded. The women’s event will see 30-40 riders complete a distance of 20-25 miles on the Saturday, and 50-60 men will complete a distance of 25-30 miles on the Sunday. Hadleigh Farm is owned by the Salvation Army. The venue covers a 550-acre site including grassland and woodland. It also includes the surrounding countryside of Hadleigh Castle Country Park. The course is set against the backdrop of the 13th century ruins of Hadleigh Castle. Construction of the Mountain Bike course was completed in March 2011. 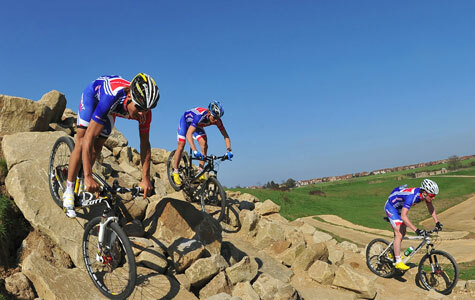 In July 2011 the Hadleigh Farm Mountain Bike International took place as part of the London Prepares series. Following this test event, which featured 82 athletes, several changes have been made to increase the technical difficulty of the course. I have my ticket for the Saturday event, so see you there! 200 Days to the 2012 London Olympics!